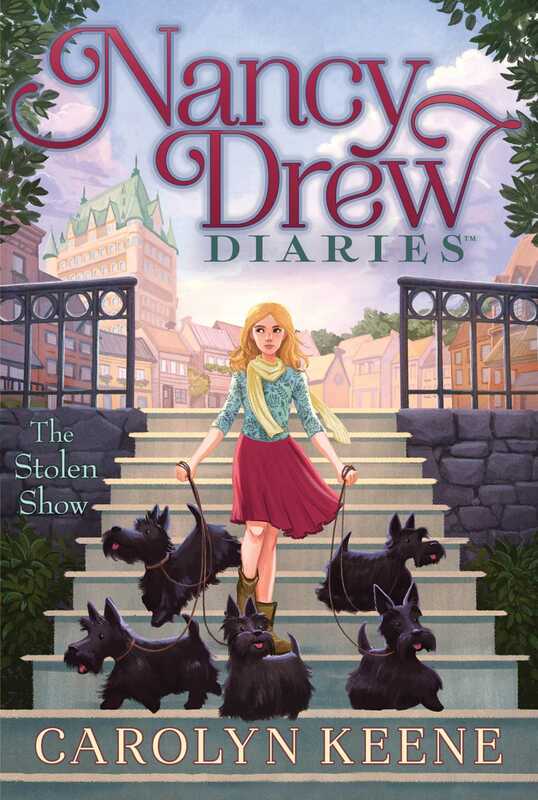 Nancy, Bess, and George race to catch an international jewel thief in this eighteenth book of the Nancy Drew Diaries, a fresh approach to the classic mystery series. Nancy is helping out her Dad’s friend, Louise Alain, and her dog, Marge, at an upcoming dog show in Montreal. Marge is a professional and needs someone she can trust to handle her at the biggest show of the season. Nancy is happy to oblige, especially since Louise invited Bess and George as well! Of course, the three friends are investigating a crime within hours of their arrival. One of the show dogs was drugged and a giant wad of gum was matted into its hair. Louise asks Nancy to investigate and gives her a useful tip: look at the dogs—their temperaments and styles are often a good window into the hearts and minds of their owners. But instead of solving a case of competitor sabotage, Nancy discovers jewel thieves have been using the dog show circuit as a smuggling operation. The thieves are not comfortable with the teenage sleuth who’s asking too many questions. And when they make some serious threats, Nancy, Bess, and George quickly find themselves in dangerous territory. Can Nancy discover the thieves’ identity and take home the trophy? Or is this one case where the bite is worse than the bark?